It is an often overlooked and underappreciated feature, but according to research, 45% of online consumers like to have a live chat feature available when they are conducting research online and prior to or during making a purchase. It’s not rocket science – in most cases a higher level of engagement between businesses and their customers creates a higher conversion rate and more sales. But it’s not quite as easy as plugging in a premade live chat feature and popping out generic messages. There are differences in ‘smart’ and ‘generic’ approaches to live chat that will ultimately make the difference between a new sale and an abandoned cart. Being able to accurately and quickly assess the signals of intent for your visitors is key to conversion optimisation. If you really want your live chat to be successful, analysing your visitors and profiling them accordingly will be vital. Rather than simply serving the same generic message to all of your visitors, you can tailor the experience based on their journey through the site, where they came from on the web and how often they have been to your website previously. By giving your visitors a much more personalised and relevant experience with your live chat feature, you will see far better results. Bear this in mind when looking for a Live Chat solution; make sure it has the ability to harness real-time data visitor data so that you can deliver a tailored and personal experience. Particularly in an ecommerce environment, it’s highly important that high value prospects are handles by a live sales agent as quickly as possible, and that the agent in question has the knowledge to overcome any of the customers’ objections and ultimately close the sale. 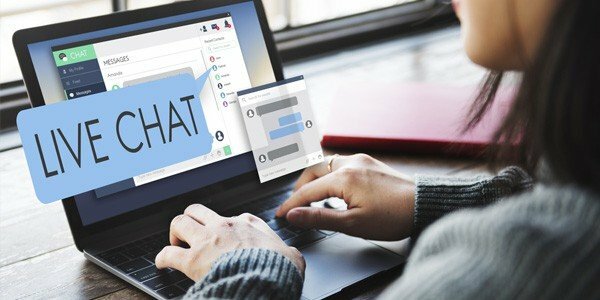 In an ideal world, the ability to seamlessly transition from live text chat to telephone (based on the preference of the customer) should be available. It’s not uncommon for a website to have a live chat feature that, after the novelty wears off, goes largely unmanned. In order for a live chat system to work effectively, you not only need agents to man it, but agents who have solid product knowledge. 93% of live chat users suggest that the product/service knowledge of the agent is what matters most. More importantly, you want good sales people manning your live chat, not just agents who can answer questions. Hiring individuals with good sales experience will ultimately mean your live chat will secure more revenue. Which of your initial approaches are most well received? How do visitors react to generic messages vs contextual approaches? How has your live chat affected average order value? Amongst many other parameters that will allow you to constantly tweak and improve your live chat feature and effectively scale your activity. To summarise, you shouldn’t adopt a live chat feature simply because there are readily available ‘plugins’ out there. You should be sure that you have the resource available to successfully man a live chat solution and accordingly research which platform will best suit you whilst offering all of the necessary data and reporting required to audit its performance.